Airbnb Cleaning Options: Should you DIY or Hire? Airbnb Cleaning Options: Should you DIY or Hire? This article is courtesy of MaidThis! Cleaning. MaidThis! is a California-based cleaning service specializing in vacation rental cleaning. Maid service is available in the greater Los Angeles (Santa Monica, Etc), Orange County, and San Francisco areas. Forget about managing your bookings, connecting with your guests, and marketing your place – caring for your Airbnb rental is almost a full-time job all on its own. It’s vital that you take the utmost care in your turnover cleanings as your new guests are expecting perfection from every angle. If something goes awry, they’re likely to mention it in their review (ahhh!) and that can hurt your business. You’ve got a few choices to keep your rental spick and span depending on your comfort level, cash flow, and availability. We’ve broken down some of the pros and cons to your 3 options: Cleaning yourself, hiring an individual, and hiring a private company. Which one is the best for you? There are some obvious pluses and minuses here, no doubt about it. Of the 3 options, handling turnover cleanings yourself is the most economical and will help keep your margins at their highest. But is it worth the savings? If you’re cleaning everything yourself, you’ll pocket a lot more cash from your hosting gig. You can still require your guests to pay the max allowed for a cleaning service charge and they’ll be none the wiser that it’s you cleaning up after their stay. If you’re a perfectionist and a bit obsessive about where things go in your home or vacation rental, you have complete control of where items get moved if you’re doing the cleaning. You likely won’t run the risk of things getting misplaced or lost. You’ll be saving a potential bucketload of money, sure, but what you save in dollars you pay for in time. Depending on the size of your vacation rental, you could be spending a ton of time cleaning after your guests have left. Remember: You may not be a hotel but your guests will expect your place to be clean and comfortable like a hotel. That means you’ve got to put in more than just a little elbow grease. To ensure you’re really really ready for your next guests, you may need to set aside an entire day for your turnover cleaning. That can cut into your occupancy rates and, in the end, cost you more than you’re saving. If you’re doing the cleaning on your own, you’re sacrificing a lot. It’s easier if you’ve got family to help but that’s often not the case, especially if you’re renting just a spare room in your home. There is a lot more to running a vacation rental business than just putting up your listing. 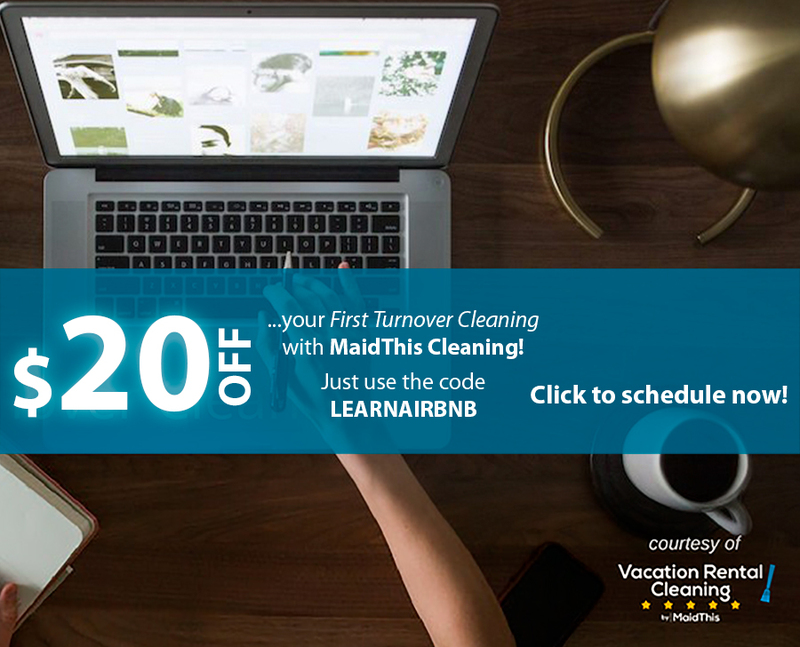 If you’re spending your time cleaning, that means you’re devoting less time to your main goal….growing your vacation rental business! If you enjoy the cleaning and will be available for it, that’s fine, but if your goal is to automate your business and/or grow it, cleaning the home by yourself won’t be sustainable. Hiring someone can be a major game changer, whether you decide to hire an individual or a professional cleaning company. Sure, it cuts into your profits a bit but, unlike doing it all yourself, you’ll be saving a ton of time and won’t need to scrub that toilet by yourself! If you’re planning to hire help, which option is the best one? Instead of working with a company, you have the pleasure of working with an individual person. You can build a relationship with your cleaner and potentially help each other’s businesses. If you host long-term guests, ask them if they’d be interested in periodic cleanings while they’re still staying with you. Have them pay your cleaner directly when he or she comes. You’ll be able to spend more time with this single individual and train them exactly how you like things. This can lead to more consistent quality since you are the one managing the cleaner directly. What if the cleaner gets sick and cannot work? What if the cleaner flakes? The worst case scenario for any host is having a guest walk into a dirty home. Relying on an individual cleaner means that if this person cannot clean, you’re either scrambling to find someone or it’s you cleaning! Unlike professional cleaning services that insist on background checks and insurance, private home cleaners may not offer the same kind of assurances. Sites like Angie’s List make a point to run annual background checks on their highest-ranked service providers but you still can’t be 100% certain you’re covered if something happens while they’re working in your home. If you want to least hassle, this is the way to go. By hiring a company that specializes in vacation rental turnover cleanings, you’re ensuring your home is more than just “clean,” it’s hosting clean. If they’ve been around for a while, they’ll have plenty of other clients you can look to for reviews and recommendations. Professional cleaning company are better equipped, generally speaking, to handle short-notice jobs (because more cleaners on-staff) and are able to handle last-minute additions if your most recent guests were a little messier than usual. Also, the most important word here is TEAM. That’s right: You’re not relying on a single person to get your place ready for your next guests which means your home gets put back together faster and more efficiently. And you are much less likely to get the dreaded “no-show” from a cleaner flaking since the company likely has multiple cleaners on hand. Professional cleaning companies will also be fully insured and have company policies in place for accidents or any other mishaps that could happen while their people are on your property. Naturally a professional cleaning company is going to be more expensive than cleaning yourself or hiring an individual cleaner. If you have a lower-priced listing, the increased cleaning fee may push some price-sensitive guests away. Though your chances of getting what you need right when you need it is much higher with a vacation rental cleaning service, you’re still at their mercy and subject to personnel availability: You may not get the same cleaners at your place every time to handle your turnovers. This can mean you’re constantly training a different team on how to handle the job at your property or showing them where to replace items that have been moved by guests. In the end, you might be doing some of the work yourself after all. That being said, if you’ve got a stellar cleaning company, it won’t matter who visits your Airbnb from turnover to turnover. A great company will have their ducks in a row and do their best to send you the same team time after time or keep notes on how things should be in your place for rotating cleaners. Make no mistake: You can’t afford to cut corners when it comes to cleaning your vacation rental. Think carefully about your options and consider how hiring outside help can boost your business over the long haul. While we suggest finding help the choice is ultimately yours. No matter what you decide, remember that it’s all for the benefit of your Airbnb business and your guests. Join our email group with over 35K hosts to get the latest Airbnb tips, news, giveaways, and exclusive LearnAirbnb offers. Great article, but sorry I am a perfectionist and would clean after the cleaner, crazy I know!!!! GAIL, MY HUSBAND AND I LOVE YOUR BEAUTIFUL HOME IN MYRTLE BEACH! CAN’T WAIT TO COME BACK. This is a great article. I think getting a certified cleaner for your rental property is always the right choice. This way you know it’s been done right every time, and you know that your guest is going to be happy with those results. yes interesting article, I provide cleaning services in Athens Greece. Please visit cleandom.eu and contact me if you need cleaning services. Really depends on specifics of what they’re offering. If they’re doing all of the work from initial inquiry all the way to check in, check out, and post check out communications, 15% can be very reasonable. It also depends on the segment your listing is in–15% of a high end high grossing unit is probably too high but 15% of a economy listing with lots of turnover (and thus work) is probably too cheap. Managing 8 Airbnb apartment is hard however whenever I hire a professional cleaner or a personal cleaner, most of them just don’t really care about your business and will sometimes just do the service to make money without the quality of cleaning. I rather spend time and clean my own Airbnb’s instead of running out of business because of people that I trusted my airbnb with.